As a small boy I lived at No. 44 Trafalgar Street during 1937-1947 – the side entrance was in Over Street. I knew Bernard Luper ‘The Tailor of Taste’ as he advertised, whose shop was on the opposite corner. Behind him going towards the station was a very large garage that was the home of ‘Unique Coaches’, and just a little further up there was a pub – I cannot remember the name – it had concrete steps leading up to the entrance. I always remember this as there was a constant group of small children outside, usually with a 2d bag of Smith’s crisps, while the parents were inside drinking until closing time. Going down Trafalgar Street from 44 on the same side there was what I can only describe as the original ‘greasy spoon’ cafe. It used to fill up after the pubs closed with those who had imbibed a little too much. If the noise got too bad my Mother would empty a large jug of water that she kept by the top floor window. When she threw this out, the noise was quickly silenced. Next to this there was a shop on the corner of Trafalgar Terrace. It was known simply as a sweet shop. Inside were shelves of very large bottles full of various types of sweets. There was also a limited supply of groceries. I do remember specifically that a tin of ‘3 Diamonds’ pink salmon cost 3 1/2d whilst the same tin in the London Road was 3d. There was also a ‘penny punch’ where you pushed a steel rod into a paper covered hole and a coloured ball would come out at the bottom. The colour of the ball would decide your prize. I now live in the US, but I remember buying my first three-piece suit from Bernard Luper (made to measure for three guineas), in 1940, soon after I left school (St. Luke’s), at the age of 14. I also remember using Brylcreem (note spelling). I was interested to read John Wall’s message. My grandparents, Charles and Elizabeth Bassett, lived in Trafalgar Terrace during the war and until their deaths in the 50s. I think the pub you referred to was The Hollybush. Opposite it was a brewery. 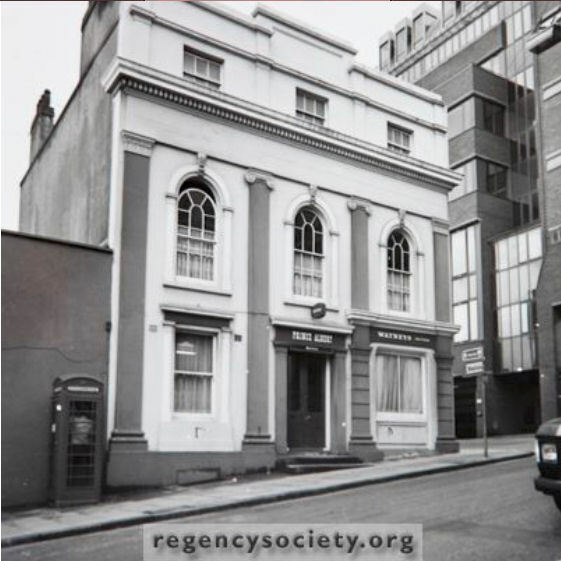 “The Hollybush “was opposite “The Prince Albert” on the corner of Frederick Place. In the image shown “The Hollybush” would be where the glass office block is. My Great Grandfather ran the tobacconist’s shop at 75, Trafalgar Street.